Fancy yoga poses – are they worth the risk? Last time I was at my hairdresser’s I read an article in some fashion magazine about Hilaria Baldwin – you know, yoga teacher, wife of Alec Baldwin? She was getting a lot of heat for posting some images of herself in intricate yoga poses in all kinds of unexpected places: staircases, kitchen counter, bathtub, etc. This article was an interesting reflection of the debate that continuously goes on in yoga circles: should or shouldn’t yoga teachers post selfies of complex yoga poses? Is it about showing off their bodies or demonstrating body’s full potential? Is it discouraging or inspirational for potential students? I’m sure you have an opinion about that. But today I wanted to discuss the merits of those intricate yoga poses: do they help the practitioner or cause trouble? In the eyes of an average Joe yoga is usually associated with wrap-yourself-in-a-knot types of poses. Hence the usual excuse for not practicing yoga: “I am not flexible enough”. This is understandable; we are surrounded by those images. I like to think of them as “show horse” yoga poses. It doesn’t mean that they don’t have benefits; it just means that they are fancy and intricate. 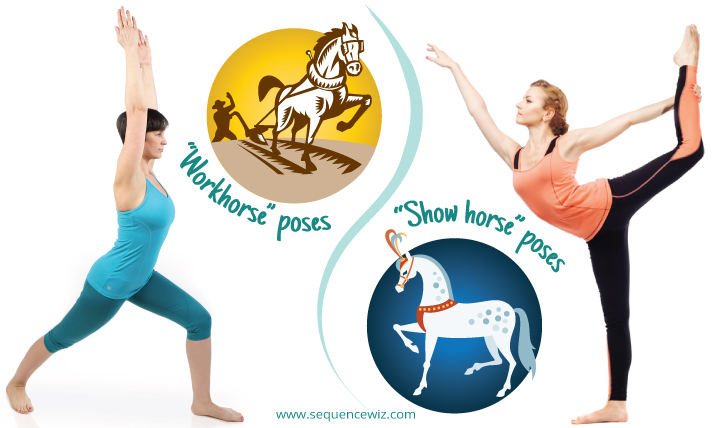 Then there are “workhorse” yoga poses. Those are the poses that are not fun to put on the covers of magazines, yet they are instrumental in accomplishing whatever it is we want to accomplish in our yoga practice. Let’s take a closer look at those groups. More likely to be a destination in and of themselves, rather than tools in accomplishing your goals. Placing too many of those poses within one’s practice can have destabilizing effect, since your body gets pulled in multiple directions to the maximum extent. Somehow we always forget the simple truth of physical stability: a deeper stretch is NOT always better. These poses are less exciting to an inexperienced or superficial observer. Here the fun comes from small details, and adaptations that can completely change your experience of the pose or what area you are targeting (we will talk more about it in the coming months). These poses form the backbone of the yoga practice. They give us an opportunity to practice “the internal intensity”: body awareness, attention to subtle details, presence of mind; as opposed to “the external intensity” of more difficult poses (the actual physical challenge). “Workhorse” poses also serve as exceptional diagnostic tools. From the way somebody positions and moves her body you can get a staggering amount of information. For example, in this pose (Cat-Cow) I would be looking at all the areas listed below and proceed with the session based on the information that I gather. ability to follow instructions, etc. The simplest poses usually give us the most information about what’s going on, and working with those poses can help us correct the imbalances that we identify. Every pose we offer to our students needs to be accessed from the standpoint of “risk vs benefit”. In more intricate poses the risk often outweighs the benefit, and in the simpler ones it’s usually the other way around. There is nothing wrong with attempting the more difficult postures – they have their place. But those need to be like sprinkles on the cupcake – used in moderation. Otherwise we get yoga practitioners and yoga teachers who look beautiful while performing their routines, but live in constant pain. And who wants that?! 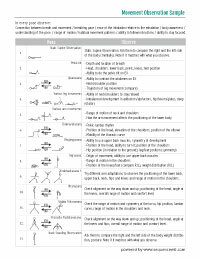 Log in to your Sequence Wiz account to get Movement Observation Form (under Forms/Handouts) to help you evaluate your client’s habitual movement patterns. Great article, blog post. I am in my late 60’s and I have been dropping, or not attempting, poses from my practice that are acrobatic and gymnastic. The dropped poses also includes head stand and shoulder stand. Thanks for the reminder. So many posts on Facebook or social media are showing more advanced poses that not only can do injury but I think put a lot of average people off even trying yoga because they think that is what it is all about. I know I started pushing too hard last year and ended up with an injury…a timely reminder to connect with and know my body. Awesome article! Being new to yoga, I have to admit that it is a little discouraging, (and at the same time motivating), to view some of these difficult, if not unattainable poses! On the positive side, it has given me the opportunity to work on ego and be totally fine with the pose I manage to obtain! I even did a class last week where I spent much of the class in child’s pose just because I needed to! So every time I view one of these incredible poses I will remind myself that this is a journey and I am content in my progress! That’s great Scott! And you get to decide what “progress in yoga” means to you. That is what my yoga teacher teaches me to during our teacher training. She teaches us to identify the postures that carries a lot of benefits to our body and the ones that are just cool to show to your neighbours. While I’m a yoga teacher and sometimes I do find arm balances fun and do them occasionally, the bulk of my teachings is essentially about using the most basic (workhorse) postures (with some variations) to go deeper into practice. Thank you Jen! I honestly wonder sometimes why some yoga practitioners feel the need to torture themselves. According to Patanjali, “avoidable suffering must be avoided”, isn’t that a wonderful principle to live by? 🙂 P.S. I had a private client at one point who came to me wanting to master headstand, and over time he did. It was a wonderful, liberating experience for him that translated into the rest of his practice. But I cannot see “working on it after class”, this kind of stuff requires serious preparation. I’ve been practicing yoga for almost 5 months now at least twice a week. I can do some of the poses with ease and sometimes challenge with inversions. I can only do assisted handstand and scorpion. Yoga has taught me to listen to my body and learn one step at a time. One day, I’ll be able to do those inversions without assistance. Congrats Rhon! I am so happy to hear that you emphasize listening to your body and learning one step at a time! To me that is the sign of real progress in yoga! Thank you so much Alexandra!